It's not an official sport, but Pokemon Go will be played in Rio during the Olympics. The hugely popular augmented reality game is being launched across Central and South America in time for the opening of the Games on Friday. 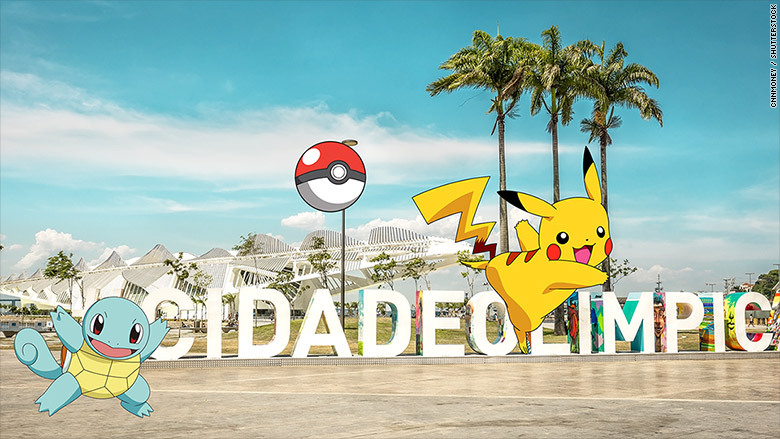 "We are excited to officially be putting Pokemon Go in the hands of our Latin American fans, visitors, and the Olympic athletes in Rio!" the app said on its Facebook page Wednesday. Some athletes had complained after arriving in Rio that the app, in which players use their phones to hunt Pokemon characters, wasn't available there. "Want to know the worst thing about the Olympic village? No @PokemonGoApp," Team USA diver Abby Johnston tweeted last week. The mayor of Rio weighed in, calling last month for Pokemon Go to launch in the city in time for the Games. Eduardo Paes aimed his appeal at Nintendo (NTDOF), which owns a large stake in Niantic, the company that created the app. The Brazilian city welcomed the game's arrival on its official Twitter account. "My Olympics will have Pokemon Go," it said. The excitement over Pokemon Go comes amid an array of concerns surrounding the Rio Games, such as the Zika virus, crime and the fallout from Brazil's unprecedented political and economic crisis. Pokemon Go was initially released in a handful of countries, including the U.S., in early July. It proved immensely popular and has gradually been rolled out to more countries. But it's still not out in some major Asian markets, including mainland China. -- Marilia Brocchetto contributed to this report.